Decision management is emerging as an important capability for delivering agile business solutions. Decision management is not a solution in its own right, but must be integrated into the solutions or business processes that it supports. 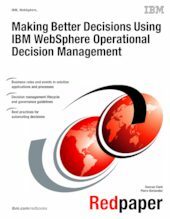 In this IBM® Redpapers™ publication, we describe the recommended best practices and integration concepts that use the business events, business rules, and other capabilities of IBM WebSphere® Operational Decision Management V7.5 (WebSphere ODM) to provide better decision making in those solutions and business processes.